“The list of urgent areas for new funding is long, but we have whittled it down to six projects we believe can have an impact, and show what we can achieve with boosted funding in future years,” said NZ On Air Chief Executive Jane Wrightson. The projects range from children’s news and new opportunities for Asian and Pacific storytellers, to stimulating more Pacific music and helping musicians get their music to audiences. In addition captioning for online content will be trialed, and a Māori drama series that had recently been declined funding due to insufficient funds has been supported. “In deciding on these particular projects we have carefully considered our core strategy; identified gaps in the content and audiences we can currently support; relied on comprehensive research, and looked for the most effective use of these precious funds,” said Ms Wrightson. 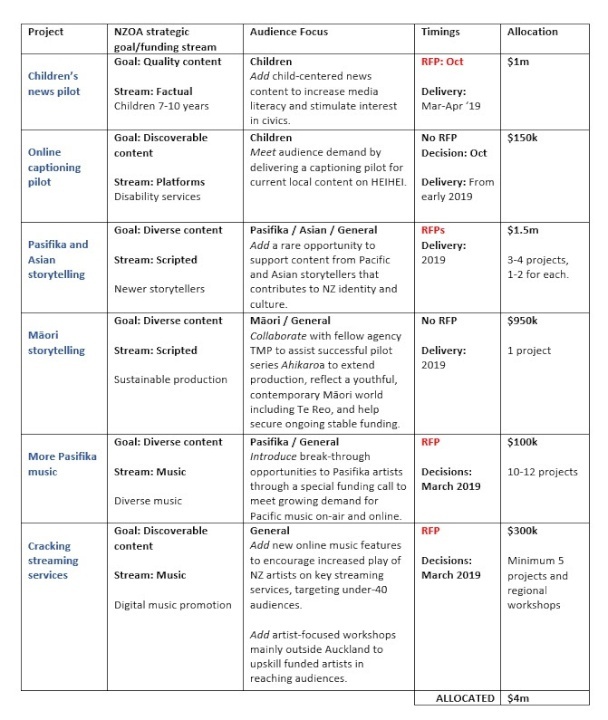 The $4m is the NZ On Air portion of the $15m announced as a boost to public media in 2018/19, along with $6m for a joint fund with RNZ, and $4.5m directly to RNZ.